Boiling Springs (8-3) became the lowest seeded team ever and first team from South Carolina to win the USA Football 7-on-7 National Championship in Hoover, AL over the weekend. The Bulldogs rallied from a 1-3 start in pool play to finish 3-3 earning the 25th seed. In tournament play Boiling Springs picked up where it left off in pool by ripping off five consecutive wins to claim the championship to end the event on an overall seven game winning streak. In the finals against host and third-seeded Hoover (9-1-1), the Bulldogs trailed 17-0 before rallying with 29 unanswered points to win 29-17. Boiling Springs took the lead for good 19-17 after the successful PAT on a 40-yard touchdown pass from Dawson Taylor to Najee Thompson. Boilings Springs defense proved to be instrumental in the victory by recording two interceptions (3 points each) and a turnover on downs (2 points each). The offense did not waste any of those opportunities as they scored touchdowns off of each defensive set up. The come-from-behind victory capped an impressive tournament run by the Bulldogs who defeated four single-digit seeded teams. Including the victory over Hoover, Boiling Springs defeated top-seeded Walton (GA) in the quarterfinals, defending tournament champion and fifth-seeded McGill-Toolen (AL) in the semifinals and eighth-seeded Spain Park (AL) in the first round. The Bulldogs defeated 24-seed Baldwin County (AL) in the second round after Baldwin County upset ninth-seeded Gadsden City (AL) in the first round. Coming off of a state runner-up finish in class 5A in 2016 Boiling Springs will open the 2017 season August 25th at Ashley Ridge. Dutch Fork was the only other team in the event from South Carolina. The Silver Foxes went 6-0 in pool play and were the 2-seed entering the tournament. Dutch Fork finished with an overall record of 7-1 after being eliminated in the second round by 15-seed Har-Ber (AR). Top-ranked 5A Dutch Fork (3-0) topped off its come-from-behind victory over Summerville with a Reese Nichols to Bobby Irby 17-yard touchdown pass with 1:28 remaining to defeat Summerville 30-28. Trailing 17-14 early in the fourth Summerville (1-2) scored 14 unanswered points on touchdowns by runs by DJ Hancock and Derrick White to go up a 28-17 with less than seven minutes remaining. Leading 28-24 with less than three minutes remaining, Summerville quarterback Jonathan Bennett fumbled in Green Wave territory which led to the Nichols to Irby eventual game-winning touchdown. Nichols finished with over 240 yards passing and three touchdowns for the Silver Foxes. Northwestern (3-1) broke open a 6-all game against Byrnes inthe second half to win 34-12 at Nixon Field in Duncan. Trojan quarterback Gage Moloney passed for over 400 yards and four touchdowns while receiver Wally Wilmore finished with over 170 yards receiving and two touchdown as Northwestern won for the first time at Byrnes since 2001 and for the time against the Rebels since 2013. Byrnes (1-3) has had an interesting summer and early fall at the quarterback spot with as many as five guys vying for the starting job leading up to the season opener. Brock Carroll has gotten the lions share of the reps since being inserted in the Myrtle Beach game. Carroll rushed for a touchdown before leaving the game with an injury and did not return. Dylon Donnahoo-who started the season opener at Myrtle Beach, passed for a touchdown in relief when the game had been decided. The loss should drop Byrnes from the rankings which entered the game ranked ninth in 5A. Spartanburg (3-1) bounced back from last weeks defeat in Georgia with a 38-7 victory over Union County (2-2). Zy’Kamren Robinson rushed for two touchdowns, quarterback William Yex passed for two touchdowns and Orinthius Byrd had a pair of interceptions, returning one for a touchdown for Spartanburg. T.L. Hanna (1-3) has played nothing but ranked foes to open the season and finally picked up its first win of the season with a 21-13 win over Belton-Honea Path (3-1). Boiling Springs won its third game in a row outlasting Rock Hill 35-32. Greenville got by Christ Church 41-7 to remain undefeated. The 5A poll will have a new number one as Dutch Fork toppled top-ranked Fort Dorchester 35-22 Thursday night. Silver Foxes’ wideout Bobby Irby racked up 170 yards receiving and two touchdowns. Ron Huff rushed for over a hundred yards and a touchdown. Justin Williams returned a kickoff for a touchdown for midway through the fourth for Fort Dorchester however Dutch Fork ran out the clock on the ensuing possession sealing the victory. Sixth-ranked Spartanburg (2-1) fell 21-14 at Etowah (GA). Ladarius Jones and Damyjai Foster each rushed for touchdowns. Midway through the fourth quarter Spartanburg was denied on fourth and goal from the one and William Yex was intercepted on their last two possessions. Etowah’s Tyray Devezin rushed for over 200 yards and three touchdowns for the Eagles. Mallard Creek (3-0) scored 21 points off of Byrnes turnovers in a 21-14 victory. Mallard Creek jumped out to a 14-0 lead on touchdown runs by quarterback Chauncey Caldwell and running back Joel Gilmore. Brock Carroll connected with Demarcus Gregory for a touchdown to pull Byrnes (1-2) to within 14-7 at halftime. The Mavericks extended the lead to 21-7 in the third quarter when Larry Matkins returned an interception 25 yards for a touchdown. Carroll connected with Quez Mays in the fourth quarter pulling Byrnes to within 21-14. Later Mallard Creek got the ball back with just over six minutes left and ran out the clock for the victory. Darnell Walker rushed for over 130 yards for Mallard Creek. 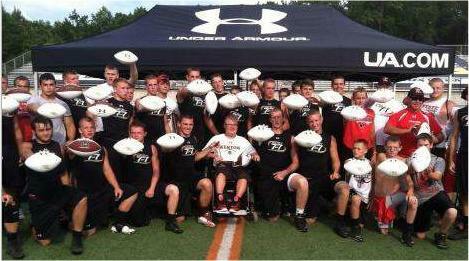 The Kenton Wildcats used a slowed down and deliberate offense to win the 11th Annual National Select 7-on-7 Championships presented by Under Armour in Hoover, Al. The Wildcats went 12-1 overall going undefeated in the tournament defeating the Byrnes (SC) Rebels 22-4 in the championship game becoming the first team from Ohio to win the championship. Kenton quarterback Grant Sherman may have had the most unusual delivery of the football from any quarterback in the nation however it was good enough for him to be named tournament MVP. During the 2012 season Sherman passed for over 4,000 yards and 49 touchdowns. Kenton posted a 6-1 record in pool play earning them the four-seed entering the tournament. The Wildcats only loss was to Dutch Fork (SC). Dutch Fork was the No.1 seed entering tournament play and defeated the only win-less team Civic Memorial (IL) (0-9) in the opening round of the tournament, before losing to Jefferson County (GA) in the next round sending them to the losers bracket where they were eliminated by Valdosta (GA) to finish 8-2 overall. Despite missing the final two games with a hip flexor, Byrnes’ Sheadon Meadors won the Daktronics Top Receiver award, Travonne Hobbs of Landry-Walker (LA) won the Neff Top Defender award while Alabama 2012 Class 6A runner-up Opelika won the Team Sportsmanship award. Defending champion and host Hoover finished 4-5 overall and did not record a win in tournament play. North Cobb (GA) finished 10-2 overall winning their first 10 games before being eliminated in back-to-back tournament games to Byrnes and Oxford (MS). The Warriors were 7-0 in pool play and were the two-seed entering tournament play. Nine-seed North Gwinnett (GA) finished 8-4 overall, fifteen-seed Valdosta (GA) went 6-5 overall losing both tournament games by a combined 2 points. Seventeen-seed Jefferson County (GA) defeated Dutch Fork in the second round of the winners bracket before falling to North Gwinnett and Oxford (MS) to finish 5-5-1. Tenth-seeded Lassiter (GA) was the only team from Georgia to not win a tournament game finishing 5-4 and eighteen-seed Alpharetta (GA) was eliminated in double overtime by Spain Park (AL) 37-36 and finished 4-5-1 overall.Combined all six teams from Georgia went 38-25-2. South Carolina was represented by Dutch Fork and Byrnes; both went 7-0 in pool play and were seeded No.1 and No. 3 respectively in the tournament. They combined to finish 20-4 overall. No Florida schools were represented.